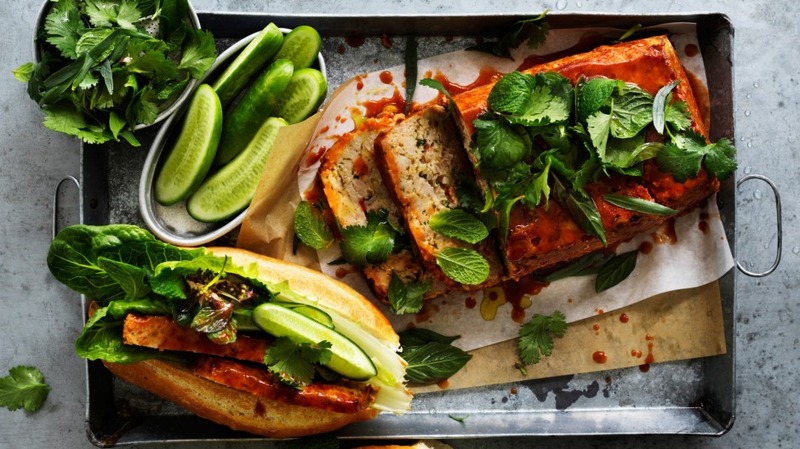 The inspiration for this dish is the wonderful Vietnamese banh mi sandwich. I have used chicken here, but you could also make it with pork or beef. The method of par-cooking in an inverted loaf tin is a nifty trick to help the meatloaf stay in shape. Pack it for a picnic, taking fresh baguettes, lettuce, cucumber and herbs with you to make sandwiches in situ. 1. Remove the crusts from the bread and tear roughly into small pieces. Place in a large mixing bowl and sprinkle over the milk. Set aside to soak. 2. Heat the oil in a frying pan over a medium-high heat. Add onion and cook, stirring frequently until soft and translucent (about 5 minutes). Add garlic, ginger, lemongrass and chilli, cook for another minute, then remove from heat. Transfer to the bowl with the soaking bread and allow to cool for a few minutes. 3. Add the coriander, fish sauce, dark soy sauce, eggs, sugar, salt and pepper to the bowl and mix to combine. Add the minced chicken and mix gently with clean hands until combined. Refrigerate while the oven heats up to 190C (175C fan-forced). 4. Transfer the mixture to a large, 1kg-capacity loaf pan (approx 23cm x 12cm x 7cm), packing it down lightly to knock out any air pockets. Cover the pan loosely with a large, double layer of aluminium foil, then place a rimmed baking tray over it. Carefully invert the tray so that the foil is on the bottom and the meatloaf is upside down, with the pan over it. Loosen the foil and spread it out, as if lining the base of the baking tray. Place in the preheated oven and bake for 30 minutes. 5. Remove from oven and carefully lift off the loaf pan. You may need to jiggle it a bit and use a butter knife to help prise the pan off. Return the meatloaf to the oven (minus loaf pan) and bake for another 20 minutes. Meanwhile, make the glaze by combining all the ingredients in a small bowl. 6. Remove the meatloaf from the oven and increase the oven temperature to 220C (200C fan forced). Spoon the glaze over the top of the meatloaf, then return to oven to bake for another 10 minutes, basting once or twice. Remove from oven and allow to settle before serving, sliced and stuffed into baguettes, with herbs, lettuce and cucumber.